When "class warfare" is typically discussed, it usually refers to the farmers, lower income or working class trying to negotiate for a larger share of the economic pie against landlords, government or business owners respectively. Sometimes there is a settlement and life goes on. Other times bitterness lingers for years or a generation. Many might label the current feud that has erupted between The Daily Show host John Stewart and CNBC as part of this tradition of class warfare, but it has really exposed a rift between the investor class between Wall Street insiders and outsiders that have faithfully invested their money over the years to save for retirement, higher education, buy a home or whatever. This rift, has exposed a deep gulf of trust that could impact personal investment & savings patterns for generations if unresolved. And this has major implications for the future of capitalism and in particular publicly traded energy companies. Or Link HERE to see the full interview on the Daily Show's website. For a quick recap of how the CNBC v. Stewart feud got started, a couple of weeks ago Rick Santelli, a CNBC reporter had a rant from the trading floor of the NYSE about how "loser" homeowners should not be helped out by the government or let courts reset the terms of loans. Stewart then wanted to have Rick Santelli on his show and when he "bailed out", Stewart ran an extended segment on all the wrong calls made by CNBC commentators and missed opportunities for CNBC reporters to ask tough questions to CEOs of troubled companies. Jim Cramer, host of CNBC's show "Mad Money", took particular offense to Stewart focusing on his calls to buy Bear Sterns stock right before it had a liquidity crisis (run on the bank) and needed to be rescued by the Federal Reserve and JP Morgan. Essentially, because of a highly leveraged balance sheet with risky assets (e.g. sub-prime loans) now exposed, there was a crisis of confidence of people & institutions that lent money to Bear Sterns. Thus, a lack of trust developed and without that trust, Bear Sterns could not continue to operate. Stewart was merely extending this concept of questioning trust in Jim Cramer, as someone who continued to pump up investor demand when he was not willing (nor his network) to challenge basic important assumptions and ask the tough questions of the companies he was recommending to his viewers. Stewart's attack on CNBC was not "class warfare" populism as you might see from say Caesar Chavez, Huey Long or more recently John Edwards idea of "Two Americas", rich and poor. It was a reaction of an angry investor himself who has probably lost a ton of money personally and is concerned about his parent's retirement funds. He's angry at Wall Street insiders that play ego games with his and "other people's money". He's angry because insiders walk away year after year with hefty bonuses while leaving outsiders that "invested" the money for the insiders to play with less than they had 10 years ago. And at another level he's angry that insiders have created such systemic financial risk that their institutions are holding the US government & taxpayers hostage to either bail them out or face the financial equivalent to a nuclear bomb detonation. Angry investors can have long memories that can last for years or generations. It's only in the last 2-3 decades that average middle class folks have developed enough trust in the stock market to think of it as a long term savings vehicle akin to a high interest saving account at a bank. Many people felt that as long as they were well diversified through a mutual fund or 401k fund and practiced dollar cost averaging of regular monthly investments they would reap above average returns with minimal risk. That's not what prior generations believed about the stock market. They thought of the stock market after 1929 as something to be fearful of, akin to gambling with your hard earned money. They felt it was best to stick to what they understood - Savings went to the bank to protect it and earn some interest. There have been long periods in the stock market history where nominal gains over 10-15 years were minimal and could have easily been beaten by interest from a savings account. 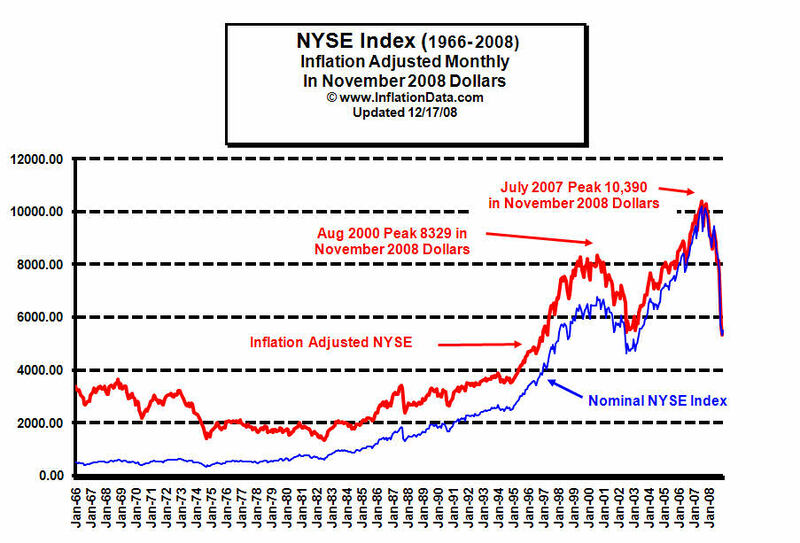 And in part it was the lack of trust in the stock market and the feeling that small investors would be taken advantage of that kept prices of stocks from inflating much beyond the dividend yield would allow, keeping stock prices close to 15-20 times actual earnings (rather than inflated expectations of future earnings). It would take the next generation that didn't remember the great crash of '29 or long periods of stagnant market performance to see the market as a way to boost the growth of savings for long term financial goals like retirement (Baby Boomers) or near term financial goals like buying a house (Gen Xers). 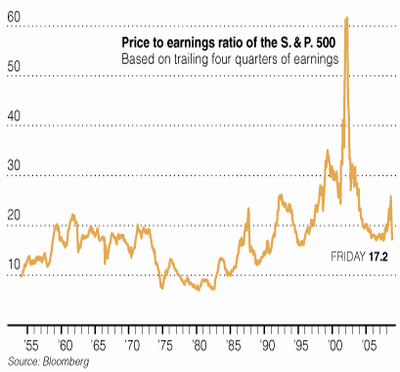 They pushed the market to new heights through the sheer volume of new dollars flowing into the stock market, creating two bubbles that both spectacularly collapsed this decade as stocks have fell back to their historical range of 15-20 times earnings. Taken together, these two bubble bursts could be interpreted as proof that growth is at best incremental and needs to be tied to fundamental. For those aware of peak oil / energy, it's another example that there are real physical limits to economic growth. And now, just as corporate earnings are set to take a big hit, the middle class is again becoming wary of investment in the stock market as a way of saving for the future potentially depressing stocks for another generation or two. That is unless trust can be restored in the financial regulatory system to identify investor risks early. Which brings us to the impact on the energy sector. The massive investments in energy infrastructure necessary to manage the decline rates of existing oil/gas fields, drill for new oil/gas resources and build up the next generation of renewable energy sources will rely in large part on middle class investors to trust that the stock market is a safe place to save money over the long term. Otherwise investment in new infrastructure will be limited to direct government spending and energy company revenue from current operations. Restoring confidence in a financial system that is based on economic fundamentals like natural capital will be important to financing the energy infrastructure of the future. The world's third-largest oil company, behind Exxon Mobil and Royal Dutch Shell, has reduced its production forecast for the next several years and is reviewing its degree of investment in major projects around the world. Because of lower oil revenues, all oil firms will need to assume increased debt in coming years to cover their dividends, capital spending and exploration costs, BP Chief Executive Tony Hayward has warned. Natural gas prices also have weakened. Hayward estimates oil prices must reach $50 a barrel to cover this year's dividend and $60 to cover the dividend and investment in projects. On the other hand, higher energy prices would further weaken the ability of the middle class to afford necessities like food, fuel and heat, never mind save for the future or invest in an unpredictable stock market (even if energy companies have good earnings). Thus, it will also be important to create incentives to invest in all forms of energy conservation and more efficient living arrangements now to prepare for higher costs later. Although it is impossible to be certain it appears we have painted ourselves into a logistic corner. Many solutions are technically feasible in isolation but don't seem to have a life of their own in the real world. Perhaps it has been ever thus and all the policies and convictions in the world would never have made a difference- our fate on this big a scale may have been sealed since the 1970s. A useful analogy may be a person running headlong toward a chasm, building up speed to jump to the other side. Close to the edge they stumble and start rolling along the gravel, only to awkwardly roll over the edge. If we are lucky the down slope of the cliff will allow a brutal but non-fatal tumble to the bottom. If we had not stumbled and made the jump and failed to reach the other side it would have been a simple fatal plummet instead. I guess what I am trying to illustrate is that this economic system failure may paradoxically save us from a far worse fate. A crippled economy is paradoxically a more modest and resource use efficient economy overall (ie save us from the worst of climate change and hard impact peak oil). Maybe the techno-utopia we imagined on the other side was never in reach anyway, or if it does exist the only way there is to slowly claw our way back up the other side of the cliff someday in the future. 1970. At the height of modern, industrial, Western civilization the Beatles disbanded. Diana Ross said goodbye to the Supremes. The US Army massacred Vietnamese at My Lai and the National Guard shot up black and white students at Jackson State and Kent State. Because of rising sea levels and the threat of increasingly violent storms, London initiated plans for the Thames Barrier. 1970. Earth Day, the EPA, the Ford Pinto and the supersonic Concorde. The population of Earth numbered 3.692 billion persons. Odyssey was on her way to the moon when her number two oxygen tank exploded. April 13, 1970, 02:07:55.19 UTC, the universe forked. It forked repeatedly. The forks are the various tracks we can go down. But jump we must. More importantly on august 15th 1971, the bretton woods system ended and nixon severed the link between the dollar/world currencies and gold. The dollar became a truly fiat currency and debt became a driver of growth. 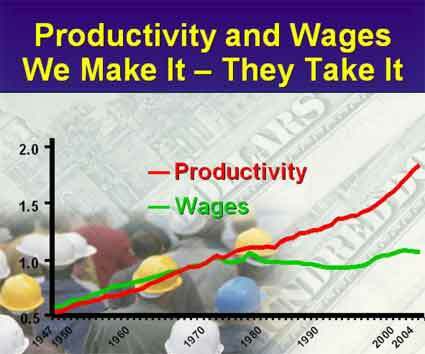 It's also as Nate points out, when the working class wages started to stagnate despite increasing productivity. Douglas-David, who says she has nearly $54,000 a week in expenses, wants the judge to declare the agreement invalid, saying she was coerced into signing it. She's seeking about $99 million — 30 percent of David's estimated $330 million fortune — and has requested $130,000 a month in alimony and nearly $390,000 in legal fees. Let's have some real class warfare. Off with their heads. Bring back the Guillotine! The king and queen tried to escape to Austrian-held Netherlands dressed as common people, but were caught. When they were returned to Paris, the soldiers wouldn't salute, people didn't remove their hats, and the people were silent. The royalty had lost all support of the people. Decline in energy surplus in a fiat (non-physical) world acts as a regressive tax, raising the GINI coefficient and increasing inequality. Rising inequality without institutional change, will cause our 'one tribe' that was built up among and between OECD nations and social strata during the 'easy' conditions of cheap energy / few natural limits, to gradually splinter into smaller sub-tribes with similar attributes. We have a strong evolutionary penchant towards cooperating/helping the 'in group' and retaliating/competing with the 'out group'. One good overview of these tribal underpinnings is Conflict - Altruism's Midwife. Another, with more of an academic bent, is Rethinking the Theoretical Underpinnings of Sociobiology. To me, our biggest challenge during resource depletion is going to be to increase the size of our 'in group' in the face of events that will naturally decrease it. The Cramer/Stewart conversation is the tip of the iceberg. The further we splinter the harder it will be to plan and implement a future that all can enjoy. Those in power (political and otherwise) now, should understand this. (but anecdotally talking to people, they don't). If the perception of climate change and ecosystem destruction (threats to the planet) don't bring us into one tribe - what will? I am hoping for aliens from outer space to arrive asap. Several in the Willits area think the Reptilian Overlords are here already. It seems overwhelming even for our alien friends/slavers. Of course, several of the believers of this scenario use psychedelics on a regular basis. Right -- you can read all about it on David Icke's sites Increasingly he conflates the reptilians with "zionists" and one is left wondering if it isn't just another anti-Semitic rant. His stuff used to amuse me, but I think he has gone beyond what I always took his stuff to be, and that is a metaphor for the "primitive reptilian brain" in all of us -- i.e., everything below the neo-cortex, where we presumably do our high-level human thinking, but which is in fact controlled by the "lower" centers. Icke's power to amuse me has waned. If I recall correctly he believes the British monarchy are also reptilian aliens. Correct, and according to the "British Israelite" theory, they are descendants of the "lost tribes of Israel", decendents of King David (along with Jesus) and therefore, rightful heirs to the world. It's a little confusing to me. You might not like what they tell you has to happen to bring Balance to the Force. Their suggestions for population reduction may wind up being very politically incorrect? For some Fun(?) How about Tibetan monks and UFO's and 2012? Remote viewing is nothing new in Tibetan monasteries. For thousands of years remote viewing in the middle of other spiritual activities have dominated Tibetan culture. What some Indian tourists came to learn from a few Tibetan monasteries under the current Chinese rule is extremely alarming and fascinating. According to these tourists remote viewers are seeing world powers in the course of self-destruction. They also see that the world will not be destroyed. Between now and 2012 the world super powers will continue to engage in regional wars. Terrorism and covert war will be the main problem. In world politics something will happen in and around 2010. At that time the world powers will threaten to destroy each other. Between 2010 and 2012, the whole world will get polarized and prepare for the ultimate dooms day. Heavy political maneuvers and negotiations will take place with little progress. In 2012, the world will start plunging into a total destructive nuclear war. And at that time something remarkable will happen, says, Buddhist monk of Tibet. Supernatural divine powers will intervene. The destiny of the world is not to self-destruct at this time. Scientific interpretation of the monks’ statements makes it evident that the Extra Terrestrial powers are watching us every step of the way. They will intervene in 2012 and save the world from self-destruction. I would argue that the competition/cooperation duality built into human beings is toggled, at least in part, by access to accurate information about "the other." In other words, "trust" and "transparency" are required in addition to "quantity" of information in order to induce "cooperation". There also has to be some perceived common purpose, or cooperation quickly turns to competition or attempts at annihilation. As small a group as a family can cooperate or become suddenly murderously competitive. All of this depended on "unseeing" the huge group that was left out in the cold ("the Third World" in shorthand). Now it is apparent that the "middle class" was just a temporarily fortunate sub-group of the Third World-- we aren't suffering much yet, but the handwriting is on the wall. And Wall Street and government -- (but perhaps they are the same?) shenanigans have exposed this pleasant mirage -- now we know that there really is no transparency, and even the insiders can't trust each other. Many people I speak to are cautiously hopeful. A world splintering into tribes and bands will possibly re-establish personal trust on a human scale. For most people, that is more important than being able to fly to Paris or Cabo San Lucas at the drop of a hat, or see a Skype videophone of the grandkids. Really old people that I know remember having a good time without all the technology we take for granted. Unfortunately, the resource base has been severely depleted since then-- but that is a different problem. I agree that splintering into tribes and bands will re-establish personal trust locally, but decisions made by the BIG tribes layered above the local strong reciprocators will have outsized impact. But I acknowledge your point - the real prize is to strengthen the foundations of those small local tribes and at the same time keep the webbing together on the larger human tribe so we don't follow the default path our ancestors did when faced with resource per capita limitations.. The North American indigenous tribes managed to avoid annihilating each other for at least 20,000 years, and they also managed to preserve, and in many cases improve the environment. I have just finished a lovely book about the Jomon people of Japan -- they did the same, though on a smaller scale. In both cases there is good evidence for extensive relations between the tribes -- the tribal leaders were apparently skilled diplomats. On the other hand, European indigenous tribes reduced their variety and numbers, and "globalized" as rapidly as their technology would allow -- until they took over the entire planet and created a wasteland. It's not a "racial" issue. The Jomon people seem to have been related to the "Caucasian" people of Central Europe-- and they were destroyed by invading Mongoloid tribes from Korea. On the other hand, the predecessors of the North American Indians were possibly "Caucasoid" (c.f. Kenniwick Man) and they were also wiped out by Asian Mongoloid types. And now the "Caucasoids" are wiping everyone out including ourselves! My basic point is that charity (i.e. cooperation) begins at home, not in Washington D.C. or New York or London or The Hague. "Globalization" is a cruel and destructive myth perpetrated by slick salesmen, and allowed by cheap energy. Give me a break. The only reason they didn't expand so fast is because they never adopted agriculture. They preserved and improved the environment by wiping out 70% of all species bigger than humans within 1500 years of arrival (yes, probably in conjunction with climate change). Were there aspects of native culture that were appealing? Sure. Would they really have been any different in their ultimate impact on the planet than other people? Probably not. Ah yes "The Nobel Savage" illusion. Along with the "Ghost in the Machine" (separate soul, separate self), and the "Blank Slate" (we come onto the planet with no genetic direction toward social constructs). Pinker has examined this quite convincingly. saying that they never adopted agriculture is an amazing statement. Indeed. The people who did actually adopt formal, irrigated agriculture (Aztec, Maya, others) collapsed. The ones who practiced what we might call permaculture or wildcrafting persisted for millenia. They also had ways of controlling their population other than warfare. And the disappearance of certain large mammals might or might not have been due to human activity -- in any case, the major extinctions were among top predators, not wholesale as our current civilization is causing. I think you are right -- "agriculture spread because it facilitated much more powerful political structures that could better compete amidst growing population pressures." Trouble is, once those powerful forces are unleashed, they eventually become self-destructive. Agriculture contains the seeds of its own collapse. Repeatedly. In many parts of the world. Discovering how to harness the power of petroleum only delayed our own collapse by a little while. Long enough for me, but probably not my children. NeverLNG -- Surely you jest. Either that, or you need a history lesson. There are at least three native American tribes in Florida alone that disappeared before the White Man showed up -- and they didn't go quietly. Many native tribes tortured and killed prisoners, and some even engaged in cannibalism. According to the book "The Wild Frontier" (you can look it up on Amazon), more than 400 inter-tribal wars were fought even after the threatening settlers arrived. And simkin, when you say that native americans never adopted agriculture, I want to smack you upside the head with a history book. That's not a physical threat, just an urgent need to get some historical facts in your brain by any means necessary, including direct injection. Holy Squanto, man, how can you make such an outrageous statement? No argument there. North Coast Indians from the Chinook to the Kwakiutl were pretty tough characters. But they somehow figured out how to stop before they did themselves in. I don't believe in a "noble savage." I don't think anyone really does -- but I don't believe in any notion of "western civilization" being inherently superior, either. The record is fairly clear -- who has killed the most of their fellow species? It wasn't Florida or Oregon Indians. A world splintering into tribes and bands will possibly re-establish personal trust on a human scale. For most people, that is more important than being able to fly to Paris or Cabo San Lucas at the drop of a hat, or see a Skype videophone of the grandkids. Really old people that I know remember having a good time without all the technology we take for granted. Unfortunately, the resource base has been severely depleted since then-- but that is a different problem. Old guy here, not really old, but old enough. I grew up in the pre-technology era. Yes, it had its advantages, and life, at least for the ordinary folk was toil by day for food, and get drunk occasionally for fun, and die by 45 or 50, with a few exceptions, if you had a lot of kids who lived past childbirth and could take care of you. Was there more trust in this agricultural situation? No. Probably less. No one trusted anyone else. You wanted something, you pay for it right there and then; no credit, no funny checks; it was cash or exchange--one yam for one of your ears of corn. Everyone armed (machetes) and no one trusting anyone else. The notion of the trusting, upright, virtuous noble savage is a total myth. Life was nasty, short, brutal. In the absence of a reliable system of "law and order," it was might makes right--me and my supporters against you and yours, and may the victor get the spoils. I doubt that we're anywhere near anything like that. Surely the people who lived in the first 150 years of this country's existence had a civilized existence--all without TV, radio, oil, cars, and so on. All the talk about doom and gloom comes from people, I suspect, of weak and nervous disposition who forgot to take their prozac. Dayahka's got it most right. Read history/logs of explorers from Victorian era. EVERY hunter-gatherer group MUST defend its territory from invaders, or starve an die out. And that defense was not by court appearances. Typically ambushes and surprise night attacks designed to entirely wipe out the invaders. Just reading histry of exploration of source on Nile River by C. Ondaatje. One of the primary reasons that source was not known until nearly the twentieth century was "the hostility of the warlike local peoples". Just saying. War and atrocitries are not a newly invented offshoot of high-energy civilizations. Study Goodall's later conclusions on Chimpanzee organization. i said essentially this to a friend yesterday. "Those in power (political and otherwise) now, should understand this. (but anecdotally talking to people, they don't)." the interview seemed somewhat staged; see the end & how controlled cramer was throughout.hopefully i'm wrong; but if not they all[tribe,includes stewart] are concerned. if staged maybe it is more TV/entertainment on stewart's part; or a compromise as the whole point was CNBC not Confronting! perhaps CNBC understands some the serious anger building up & even sending cramer in there is to bleed off some of this energy; but i agree not likely to be enough. my friend just told me (I dont have TV) that CNBC is discussing a bill being floated to tax AIG employees 90% on their bonuses. Such a bill would have no effect on the many recipients who do not live in USA. The whole affair is a distraction. The Masters of the Universe are spinning madly -- hopefully, the hoi polloi are fed up to the point of actually paying attention, but I'm fairly pessimistic on this point. They don't need to be baby-stepped in Nate. Rip up AIGs corporate charter. We've got a black man who claims to be a Constitutional lawyer in the White House. Who better to repeal the 14th amendment and put the corporations back in the box? They are not people and they don't get the rights of people. That's a bit melodramatic perhaps, but we have to strip corporations of their power; they are the motors in this runaway train and their gears have to be spiked. Doesn't mean they go away, it means the rules under which they play must be subject to democratic processes. Right now they are immortal Gods. The problem is much less the people getting the bonuses than it is the corporation paying them. The solution is much less taxing the bonuses received, than forbidding and penalizing, dismembering and shutting down the corporations. Too big to fail? Break them up. What does Obama being a black man (actually half-black) have to do with anything? Maybe you haven't been following current events, but his administration is following lockstep behind Bush's in virtually every area of any real substance. He might as well be a white man, following your line of reasoning. Rest assured that "the Chosen One" has not the slightest inclination to "break up" corporations and disrupt his handlers' profits. Sorry to say it, but the revoking of the corporations' "personhood" isn't going to happen any time soon -- if ever. I'd argue that at least in the US, the 14th Amendment - which freed the slaves and the corporations has a lot to do with the "legal" underpinnings of our various current crises and the massed power that prevents any real action on them. Of course, New York could revoke AIGs charter too, but I doubt Cuomo will dare go there either. [I'll not bother to look up where and how AIG is chartered, but certainly NY could revoke their right to operate - and you are right, they will not. If my memory is correct, New York was the last state to take such an action - in the 50s I think.] So it's all bluster meant to appease. As Homer Simpson would put it, it takes two to lie: one to lie and one to buy the lie. That corporations will go extinct, I'm certain. They cannot outlive their hosts. US Constitution, Article I Section 9: "No . . . ex post facto law shall be passed"
Now, why you wanna start bringing that old 'rag into the conversation? When's the last time that Con-sty-toon-shun got durn followed? To take a bit of a contrarian view .... if Congress passes a bill to tax the AIG bonuses, the US government will have an extra $160 million in its coffers to once again piss away, as only it can. On the other hand, if the AIG hot shots get to keep their $160 million in bonuses, they will no doubt spend a good chunk of it on frivolous stuff like luxury vacation homes, private jets, pleasure boats, and the like, in which case that money will be (more or less) recycled back into the economy. From a purely cost-effectiveness standpoint, it's not obvious to me which outcome harms the taxpayer the least. Either way, the money has been sucked out of the taxpayer's wallet. It is really but a shell game. The US government can make a big show of pretending to be punishing AIG for its extravagance, but the reality of the situation is that it has already dumped close to $200 billion into AIG, a large amount of which has already gone to paying obligations to counter-parties, many of which are large financial institutions and many of which are not even in the US. So, AIG can also pretend to be giving those bonuses back, but there is absolutely no doubt in my mind that they plan to make up for this temporary 'loss' after things cool down by simply tapping into the government bailout money by various and sundry indirect means. They evidently have very creative accountants. AIG is truly a 'hedge fund'. It has been reported that for the 2008 election cycle it made something like $644,000 in political contributions, of which (if I recall correctly) over $100, 000 went to Obama, a bit less to Senator Dodd, $60,000+ to Hillary, and roughly $50,000 to McCain. Much of the remainder was nicely split between various Republicans and Democrats. Now that's what I call hedging. Regarding the benefits of tribal arrangements, while it may make for nice cozy local settings, let us not forget that one of the chief pastimes of tribal peoples is slaughtering one another. Be it a centuries-old blood feud in the wilds of Pakistan or the holocaust in Rawanda, this stuff has been going on since day one. Nor does tribal culture tolerate members of their own who don't fit in or have committed some sort of taboo. I recently watched a truly horrible YouTube clip of some tribal people in Niger beating, stomping, and burning to death five people accused of witchcraft. I don't think there was much in the way of due process involved in arriving at their guilt. On the other hand, if the AIG hot shots get to keep their $160 million in bonuses, they will no doubt spend a good chunk of it on frivolous stuff like luxury vacation homes, private jets, pleasure boats, and the like, in which case that money will be (more or less) recycled back into the economy. You do understand that much of that money would leave the US of A and would not be 'recycled back into the economy' of the US of A? Yes I do .... which is why I said 'a good chunk' rather than 'all'. Keep in mind that a 'good chunk' of US government spending also leaves the US of A, mainly in the form of the tens of billions worth of aid to various countries so that they can pretend to be our friends, not to mention a portion of the money we're spending on Iraq and Afghanistan. Besides, the government can go through the charade of giving the AIG money back to the taxpayers, but in reality it will merely be taking it out of one of its pockets and putting it in another. While $160 million is real money to you or I, to the US government it's equivalent to nickels and gets lost in the noise. If you're as upset about money leaving the US as I am, then one's anger is more legitimately directed at the billions of bailout money that has already gone to foreign banks and investors. Also quite infuriating is the fact that AIG paid out most of its counter-party obligations at full face value, so these financial entities didn't have to take even a minimal haircut. Friends take care of friends. Nate you lost me right away this time ! 'One tribe' what the hell is that supposed to be, could you define it. Is it the Microsoft type corporate 'we gots tech' tribe, maybe a Bankster 'brightest and best' buddies for cash tribe, the entrepreneurial rapacious pterodactyl tribe or just us, the everyday beer guzzling couch potato tribe? The only 'one tribe' that, I can see, that will have any traction in these days of the Armageddon is in the Indians (the native indigenous ones) who seemed despite our depredations have kept some semblance of a community through the past half a millennium and I understand are quietly beavering away at rebuilding it. read the Bowles pdf - we evolved in tribes of about 100-150 in size. Modern cheap energy fueled society, and the economic carrot has made us 'feel' as if we are all part of same tribe, suppressing racial, finanacial, geographical, national, political, religious, etc. differences because 'everyone' has mostly agreed on pursuit of economic growth as a common purpose. As that purpose falls apart, it is likely to cause a resurgence of these smaller 'tribes'. Sorry - to be clearer would take more time/skill than I have now. cheers. One thing I think this highlights is the need to learn from our own distant past, and to realize that we can implement those lessons without reverting to the exact lives of our past ancestors. I wonder how the ideas Bowles expresses in his essay would integrate into your thesis on the nation-state (that you linked on your Mexico post the other day). If altruistic + parochial manifests itself in modern nationalism as Bowles suggests, then it seems selfish + tolerant has proven to be the hallmark of globalism. Perhaps it wasn't supposed to be that way, but it looks like trickle-down just hasn't happened, and globalism in practice has resulted in wealth being concentrated in a few hands at the very top. Bowles favors altruism + tolerant, but questions if we're hard-wired for such a combination. Just wondering how all this ties into your thesis. I think "parochial" is an issue of primary loyalty. Nation-States work to make the "Nation" the only relevant point of allegiance, and to erase allegiance to village, tribe, religion (unless it is one and the same as the Nation), etc. I think that people's ability to be selfish and tolerant stems more from their relative security and the transition of the omnipresence of the relative political entity (tribe, Nation-State, etc.) to the subconscious or relative unimportance. How many American teens really think their way of life is under threat? Not their dad's job or those damn liberal abortionists, but the actual existence of a world where they can drive a car to the drive-through? Sure, there are some, but compare that to the number of German or Italian teens that likely felt that their basic existence was threatened just prior to the respective rise of fascism (just thinking out loud here, no data to back this up). So I think parochial is directly proportionate to the perceived threat to our fundamental (however we subconsciously define that) way of life. For that reason, I think we'll see a much more parochial world in the future to the extent that we fail to prepare for what is coming (and depending on how bad that future is). What you describe sounds kind of like the diaspora. So it sounds like you believe altruistic + parochial is what it will be, just divorced of Cartesian boundaries and tribe being dependent on criteria other than national loyalty. And what about within the Cartesian boundries of a nation-state? Do you foresee disentigration there as the nation balkanizes into ethnic, racial and religious groups? I think "Balkanization" still sticks to an exclusive, Cartesian sense of space. I think what will happen is that there will be multiple parties laying claim to the same geographic territory, and all exerting differing degrees of influence and control within the same space. We already see this, of course, I just think it will become more pronounced. As to your thesis, as I expressed on the Mexico thread the other day, I don't see why, if altruism + parochial it must be, why a super-charged, beligerent nationalism a la German national socialism is not just as likely an outcome as the one you postulate. Also, why shouldn't we strive for altruism + tolerant, as Bowles suggests? Maybe the propensity towards altruism + parochial can be overcome. ► She demanded immediate action to erradicate the telephone extorsion originating from the prisons. "The possiblity shouldn't exist to introduce cell phones into any prison," said Ana Franco de Wattnen, president of Mexico United Against Crime. ► A group of 1600 police in Cd. Juarez, the most violent place in Mexico, were disarmed in order to become drivers for the army, who has 8,500 soldiers deployed here to combat organized crime... This city across the border from El Paso, Texas, which in 2008 recorded 1,650 violent deaths linked to organized crime, is now practically militarized. ► Calderon emphasized that in the 27 months of his government, the resources commited to order, security and justice have more than doubled and now amount to more than 1% of the GNP. ► "The water crisis threatens all countries, poor and rich, and all will be affected," said Enrique Peña Nieto, governor of the State of Mexico. His remarks were made before the Fifth World Forum on Water in Istanbul, Turkey. He said that there currently exist 1.1 billion people worldwide that do not have access to potable water, that in the next 20 years the global consumption of water will increase considerably, and that in 2025 the population of countries experiencing water shortages will be six times greater than today, affecting some 2.5 billion people. ► The legislative assembly of Mexico D.F. agreed to prohibit retail establishments from using plastic bags, with the goal of reducing the usage of packaging that can take from 400 to 1000 years to reintegrate into the environment, and mandated that businesses should offer low-cost cloth or biodegradable bags. I don't know, I think these data points can be interpreted in many different ways. Take the street price of cocaine, for example: Sounds like that's more a victory in Colombia than in Mexico, as my understanding is that Marijuana is increasingly the #1 revenue generator for Mexican cartels. This is consistent with the trend based on when I last attended a National Marijuana Initiative (a joint agency task force) meeting in 2005, so my data could be a bit dated. Also, as with oil producers, a doubling of the price for a low-elasticity of demand product probably means that the revenues earned by the cartels have actually decreased, not increased. This isn't clear proof, but I read it as a sign that, while the "war on drugs" may be achieving its stated metrics, it's actually increasingly counter-productive. I did, however, hear a piece on the growing de-criminalization trend on NPR while headed home today, which might bode well for the Mexican government? Yes, I've recently heard the same thing, that marijuana is by far and away the biggest cash generator for the Mexican drug cartels. However, I have also heard that, even though most cocaine is produced in South America, its pathway into the United States is via the Mexican drug cartels. I'm all in favor of the legalization of marijuana, so I suppose from my perspective, there might be a silver lining behind the economic crisis. A lot of useless, if not nefarious, government expenditures may be eliminated due to economic exigencies. Sometimes I think there has been a deliberate attempt to get Americans off on these bunny trails, like the war against drugs, when the real crimes being committed in this country for the last three decades were being perpetrated in the corporate executive suite. Have you noticed that many of the same people who champion liberty, individual choice, laizzez faire and doing away with regulation of the financial world are also some of the most committed to prosecuting the war on drugs? That's call a wedge issue, hot button social issues that fire up the masses but are utterly inconsequential to the Money people. Howard Dean got it, and he summed it up as God, Guns and Gays. As long as Americans let ourselves be divided by social wedge issues, we have no chance to stop the looting. Marijuana is a little different. I think capitalism is predisposed against it because it's cheap, natural, and makes people content with their lives and therefore bad consumers. In tribes of 100-150 everyone knows everyone. We have adaptations designed to allow us to form larger groups and identify group members in other ways: We are the group that dresses like this, wears our hair like that, can pronounce "th", believe X [where X is complex and something that no reasonable person could believe], understand arcane aspects of our native language/dialect, hold particular facial expressions, follow mysterious cultural behavior... So the trick is to be in the correct self-identifying group: the one where members will actually help each other, and be able to do so. And if you're in an attempt to build such groups (like Transition Towns) then I'd recommend working on all those human ways of making a group self-identifying. Of course this will make other people/groups hate you, so you need to keep a lot of it secret. Oops, this is starting to sound like a nightmare. No wonder we want growth to keep going, even though we haven't really enjoyed it and we know it's an environmental disaster. Thanks Nate, quite clearly stated. Only one thing though, the reason I had thought everyone sounded so interchangeable was because they had all been watching the same sit coms and that doesn't take much energy of any sort. the videos are not visible outside the USA, unless you're in Canada and can tap into thecomedynetwork.com. Otherwise, you're S.O.L. I'm sure there's more - but I have to trot right now. Thanks Stuart, the link above wasn't available everywhere in Canada either. Took a while but the clip came through. The entire 500 year experiment with fiat money is over. They're printing it up but the central core has melted. They can't get it out to flyover country. We're on the razor's edge. "We have seen nothing that speaks of the promise that we felt when America said "enough" and voted for a change in the fall of 2008." Households haven't even begun deleverage and they have no assets. The model for our future is not Easter Island as many believe. It is Haiti! The fabulously rich live in impregnable compounds (protected by the U.S. military) on beautiful beaches in the midst of unbelievable -- unbelievable to the average MSM-addicted American, that is -- squalor and environmental degradation. If there is any hope for the masses of us, it is to create local communities that can share the resources that are left over from the depredation of the Financial Overlords. Where will the military get the energy to protect themselfs? I still maintain the basic problem is the over concentration of wealth at the top which is reinforced/promoted by a tax code that taxes those at lower levels more heavily than those at the top. In addition the wealth at the top is expanded by weak to no enforcement anti trust laws. Rarely are mergers and buyouts rejected by regulators. This policy has been effect for going on 30 years and began with Reagan. This ultimately leads to the Too Big to Fail problem we now face. We are now reaping the rewards of tax cuts for the rich that have resulted in increased concentration of wealth/income at the top. When this happens those at the top, ever hungry to increase their income, start lending to ever less credit worthy borrowers because that is all there is in a system with concentrated wealth/income. They also have the means to buy the media, as in the case of CNBC, to promote their agenda to those below and to government. And they have the means to hire lobbyists and donate to politicians who then make regulatory and law changes such as those that have led to this financial meltdown. As a result the system no longer functions, if it ever did, for the betterment of the whole, but for the betterment of those at the top who are running it. Some may argue that federal tax rates at the top are higher so the wealthy are paying their fair share, but they do not take into account the total tax picture. The total taxes paid by those in the lower income levels is a much higher percentage than taxes paid at higher income levels. Warren Buffet has pointed this out many times. Why is this true? The first big one is social security tax. It ends at about $100K or so. The second one is the state sales tax. Since only so much in goods can be consumed because of the demands of space and time, the wealthy tend to invest more and as a consequence pay smaller portions of their incomes on sales taxes. Lower incomes have to spend in order to survive and save less. When they spend they are hit by the sales tax. The results of these and other tax issues is to over time make it easier for those with a wealth base to increase it. round of trying to survive in a system that is rigged against them from which they rarely escape. They are told that they should be grateful for all the goodies they get and that those collecting the big pieces of pie are deserving because of their "talent". x -- they (we) were grateful for all the goodies for about 50 years -- while the goodies lasted, that is. What's the Matter With Kansas? sets the stage, but doesn't draw the obvious conclusion. The bread and circuses are so over. 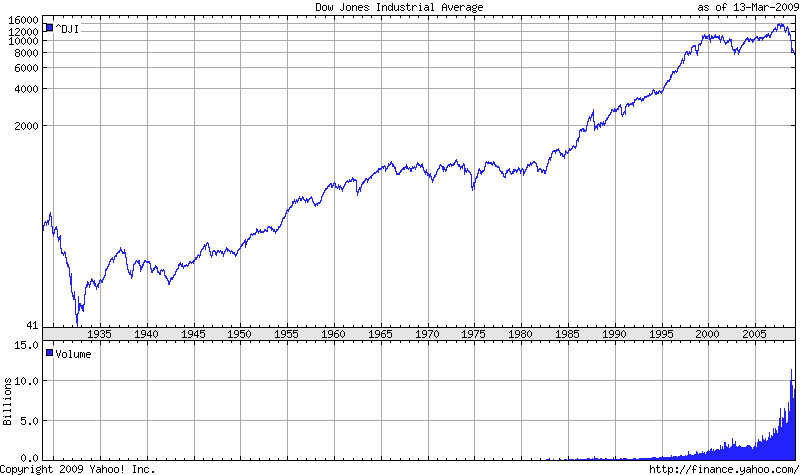 I had moved the majority of my funds out of equities when that damn fool "Dow 36,000" article came out in 1999. I saw that as the modern day equivalent of 1929's "Stocks seem to have reached a permanent plateau" idiocy. Turns out that my call was the right one. I was reluctant to get entirely out of equities, though. I believe strongly in diversification, and felt that I must leave at least part of my funds in equities. No longer, I have completely closed out all of my equity holdings. I do not expect that I will be allocating anything to equities again, unless and until there is a profound change. Why? Several reasons, really, which piled up until the "camel's back" was broken. First, and probably most decisive, is the observation that US corporations are no longer being run for the benefit of their shareholders, but rather for their managements. When there is an economic downturn and the corporation must retrench, it is dividends that get cut, not executive bonuses. Being something of a contrarian, value-oriented investor, I have long placed greater importance in dividend yields than have some investors. Expectations of future growth is highly intangible - imaginary, really - while dividends are tangible. Unfortunately, in the US less and less importance has been placed upon dividends, so they are increasingly viewed as being something optional and dispensible. Everyone has become so seduced by "growth" driven capital gains instead. However, "past performance is no guarantee of future results"; what goes up can come down, and, in fact, has. The stock market, IMHO, has evolved into something that really is not all that different in essence from the type of games that one might find in Las Vegas, Atlantic City, and various Native American reservations. None of these seem to me to be suitable instruments for investing my precious savings. Speaking about corporate management, there is a further issue of confidence in their management ability - or rather, the lack thereof. I have become increasingly convinced that many, if not most, US corporations actually are not run all that well at all. There are exceptions, of course, and this is hardly something unique to the US. Most corporate managements strike me as being hopelessly over-optimistic; they would refuse to even consider the possibility of long-term resource depletion and economic decline, let alone the contingency of any unexpected "black swan" events. An investment in shares of stock in a corporation is in effect a bet on the future performance of the corporate management; for the most part, it does not strike me as a particularly good bet. Speaking about long-term economic decline: if one assumes that the probabilities of this is very high (as I do), then what possible reason could there be to hope that equities will perform well over the next few decades? Equity values do not always correlate with economic growth rates, but over the long haul they come pretty close. It just seems to me that, at least when it comes to a long-term "buy-and-hold" investor, equities would appear to carry a very high risk of long term loss should the economy in fact decline as I expect it to do. Add to all of this some of the things that are now becomming clear: the gross negligence, incompetence, and maybe corruption on the part of government regulators, and the almost total lack of effective regulation of the financial markets and institutions; the distortion and manipulation of markets by unscruplous insiders, sometimes with the complicity of the media; the asymmetry between the long-term interests of the holders of financial instruments and the short-term compensation arrangements for financial intermediaries; and the widespread breach of fiduciary duty and outright fraud, which is not only going unprosecuted, but is actually being rewarded through government bailouts. Why would anyone in their right mind want to invest even one penny in the stock market given these circumstances? Not I - not now, and never again - unless and until there is one hell of a clean sweep undertaken, something going far beyond anything that Obama & Co. can apparently even dare to consider. Oh, and one more thing: If my thinking is not unique to me alone but happens to become more and more commonplace, then the grave for the stock market has indeed become well and truly dug. I'm based in the UK not the US but fear our position might be even worse! I was thinking of posting something, but you're final paragraph says it all. Does anyone truly believe that there will be any reinvestment into the market by the those trusting souls that invested their futures to these crooks until the clean-up is complete? for many it is too late. Please excuse me for posting this twice, but it is far more pertinent to this topic thread than the one I originally attached it to. If I had known this topic was in the pipeline I would have waited another three minutes. At the risk of sounding redundant (small risk, since I readily stipulate the fact) the problem with the world economy, 'free market capitalism' (Hah! ), the so-called 'bail outs' (Hah! ), AIG bonuses, Wall Street chicanery and a host of other financial debacles is so utterly intrinsic to our human nature that a massive extinction event is probably the only thing that will cure it. The tragically false belief is that there is anything, in this mercilessly physical universe, even remotely akin to "profit" (used in the sense of gaining more from an investment than was put into it by all involved parties in the first place.) It's a concept comparable to a 'perpetual motion machine', and if you think such a device is possible then I would would like to sell you shares in a company that says they hold the patent. There can even be hope of profit, as attested by widespread faith in the magical "Unseen Hand" of the marketplace. But, alas, there is no such thing as financial profit. I refer all engineers [and arm chair financiers] to the physical law known as Conservation of Energy, and its firstborn son, the First Law of Thermodynamics. To know that those principles are true in the realm of physics (and petroleum extraction) and nevertheless hold simultaneously to the belief that they do not apply to money... well, it's just sad. Think of commerce as a cup, and all human activity as a quantity placed in the cup for later use. One can get from that cup exactly as much as was put into it, minus a some evaporation, a little spoilage and a few minor spills "Twixt cup and lip." That's it, and that's all. The rest is flim flam designed to separate victims from what they have labored to put into their own cups. But a piece of advice to novice Capitalists: don't call it flim flam and theft. That just alerts the marks and makes 'em cautious. Call it Economics and Profit. This is about the flimsiest flim-flam I've ever heard. How does this prove that profit isn't possible? What does this even mean? The passage you object to was never intended as a 'proof'. It was merely an illustration, to make the point easier to grasp. Apparently not easy enough, heh? There is nothing flimsy about Conservation of Energy, or the First Law of Thermodynamics. Rare is the day that these are not directly or indirectly referenced right here on TOD. The delusional thinking that we greedy humans employ to persuade ourselves otherwise is just that: delusional. To make a 'profit' from any product which exceeds the sum total of energies that went into making that product would require the creation of energies that did not exist previously. Godlike. And, unless you are God, impossible. Trace any so-called 'profit' in the financial realm back to its source and you will find a victim (or plural) of theft. There are no exceptions. The second half of KMO's interview with Charles Eisenstein is online at c-realm podcast. It covers a whole bunch of points, but about halfway through - after the musical break - there's a point where they discuss how profits are little more than a capturing of the commons. I think back to the arguments Ben Franklin made about patent and copyright. Protection granted for a limited time - which was then 7 years - and in exchange for ownership reverting to the commons. Mickey Mouse is never going to revert, so how does Disney get to claim protection of its interest? Lawfare. Anyway my understanding is Michelle Obama is an Intellectual Property lawyer - to my mind the most evil of all the lawyer types. Something to ponder. Excellent analysis, Glenn. Thanks for posting this as it's a dialougue that very much needs to take place. Very few of the heroes of the Golden Age of American finance had much interest in the solid realities of what underlay their structure of stocks and bonds and credits. Later on, a Henry Ford might introduce an era of intensely production-minded captains of industry, but the Harrimans, Morgans, Fricks, and Rockefellers were far more interested in the manipulation of huge masses of intangible wealth than in the humdrum business of turning out goods. As early as 1983, Stuart Butler (of the Heritage Foundation)--the Waldo of the conservative policy movement--had co-authored a strategy memo in which he called for expanding tax-free private accounts into "a small-scale private Social Security system," while mobilizing "banks, insurance companies, and other institutions that will gain from providing such plans to the public." It's odd that the so-called party of the working classes, women and minorities -- all demographics statistically less likely to invest their money -- is seeking to deny major portions of its voting bloc the chance to become part-owners in American companies. Instead, Democrats would rather citizens be wholly dependent on the period scheme that is Social Security and the party's politics of entitlement. But what to do? As you so aply point out: "The massive investments in energy infrastructure necessary to manage the decline rates of existing oil/gas fields, drill for new oil/gas resources and build up the next generation of renewable energy sources will rely in large part on middle class investors to trust that the stock market is a safe place to save money over the long term." How do we lure rank and file Americans back onto the preserve? Right-wing neo-liberal capitalism has been tried and found wanting. So has left-wing state socialism. Time to try a third way. The third way is based upon cooperatives and other forms of non-governmental public ownership. For example, imagine a restructured public retirement fund that is operated by a board of trustees that is elected directly by and is responsible and accountable directly to the people, rather than being run as a government agency. Imagine rail and other transport systems, each operated by independent boards of trustees elected directly by the people. Imagine a financial sector largely dominated by depositor owned credit unions, and with a central bank that is run by a board of governors directly elected by the people. Imagine the nation being served by a network of customer-owned electric co-ops and natural gas co-ops and fuel dispensing and delivery co-ops, all run by boards directly elected by their customers. Imagine a national oil & gas company, run by a board directly elected by the people. There would still be space for "private enterprise" in such an economy, but that space would be dominated by self-employed individuals and small, family owned businesses. There would still be ways in which government would enteract with the economy, but it would be mostly limited to protecting human health and safety, the environment, and other essential regulatory activities; the provision of most goods and services would be in the hands of co-ops and public trusts. I doubt that such a system will ever be tried - too big of a paradigm shift for hidebound people stuck in old modes of thinking, and too big of a threat to entrenched vested interests. It is a pity, for I can think of nothing else that might promise to actually bring us through the "long emergency". Somehow I doubt people have the time and patience to adequately research and make good decisions in these hundreds of elections. People can barely be bothered to vote every two years. Maybe so, but if things ever were set up this way, then they would have nobody to blame but themselves if they didn't like the way things were being run. You sound a bit like a bureaucrat who thinks organization and accountability are the ultimate virtues and anyone who complains about any amount of resulting paperwork is a malcontent, no matter how absurdly onerous it gets. What in the world does assessing blame for when the system crashes have to do with its effectiveness? The basic point was democracy scales quite poorly. That's not the fault of the participants when complexity rears its ugly head, it's a structural problem that lies in the proposed system itself. 1) Mitigate the corrupting influence of money on politics. Notice I didn't say remove, because that's not possible, but you can dramatically reduce it. This will help reduce the number of elected officials who are out for themselves and those who give them contributions. 2) Incorporate sustainability into all governmental policies to remove the short-term focus. Incorporate it into school curriculum, accounting, finance, engineering...everything else too. 3) Use regulation to provide market fairness, stability, and sustainability, rather than profit maximization. There are two ways this will happen: By design, or by collapse. We'll see which occurs first. Of course, the influence of those with money or power is also a problem in both capitalist and socialist systems. I suspect that it is not possible to have a "people-proof" system. Empowering people with a dual vote - their dollar vote and their ballot box vote - would seem to me to be about the best that we could come up with. What they do with those votes, and the consequences thereof, are up to them. Angry investors can have long memories that can last for years or generations. Bubbles used to happen once every generation or so, because it took time to forget the pain from the damage. Today we are facing the bursting of a second major asset bubble, housing, spaced less than ten years from the bursting of the dot-com bubble. This is simply astounding and thoroughly unprecedented. This is the real deal - I can’t believe how good this guys is. In Ben Bernanke I trust! The dot-com collapse, which was horrific, was disguised by the events of 9/11. The public was distracted with the war on terrorism. Unless we get another airplane or two flying into a building somewhere, I don't think we'll be quite as distracted this time around. Class warfare? Nonsense! Wall Street, the media and government have been at this for centuries... (If you doubt it, message me and I'll point you to a 100 year old book that showed the same games being played out). Pushing worthless paper, or even tulip bulbs, on the ignorant masses. "Buy and hold" is nothing more than a slick marketing campaign. People bought stocks because they were going up and they didn't want to miss out. Smart professionals also have an exit plan. It's not about class. It's about recognizing that everything on TV is marketing. It's about educating yourself and not letting some salesman "manage" your money. I'm sorry for anyone who lost their home or retirement. Learn these 2 things and empower yourself, or just bend over and wait for the next reaming. Five weeks ago, when I asked a Wall Street titan what one should do to be safe in the future, he took me aback with the concreteness of his advice, and its bottom-line nature. Everyone should try to own a house, he said, no matter how big or small, but it has to have some land, on which you should learn how to grow things. He also recommended gold coins, such as American Eagles. P.S. For those of you who say gold doesn't matter, I recommend you read Ferfal's accounts of life in post-financial collapse Argentina - Lessons From Argentina's Economic Collapse (PDF). That's someone who's been there, as opposed to you armchair theorists who insist there is no role for "hard money" if society slides into the toilet. Of course much of what he says will offend certain delicate sensibilities, but homo sapiens is a wild animal, not some rational creature predisposed to carefully considered thought. And mind you, if the US goes, the Argentine situation will probably seem positively comforting in comparison. I don't disagree, but remember that the USA does differ from Argentina in that huge sections of the USA are among the most violent crime free areas in the world. Huge sections of the USA have not had a tradition of violent crime and thievery, unlike most of South and Central America. OTOH the bad areas in the USA can match up with anywhere. Many good points, but I think you don't go nearly far enough in drawing conclusions from resource depletion (and ecological devastation). The industrial era itself is in decline. This will throw us back to a total dependence on the soil, water, forest, etc., the very resources we are destroying in order to extend industrial era a few more years or decades. So what logic is there to investing in ANY expansion of the energy sector which will further destroy these ultimate resources? Why do we not restrict ourselves to running down the currently operating sources while moving ASAP to a radically reduced footprint on the planet, (which many have advocated elsewhere)? You're right about the fight within the investor class. The big guys are certainly trying to rescue or even further enrich themselves at the expense of the middle class investor, and they have the gov't on their side in doing that. But the middle class investor is going to lose, and the middle class is going to get wiped out one way or another. The economy has avoided a crash this long only by a massive explosion in debt. The debt bubble has now popped. There is no conceivable way the economy can ever grow its way out of this crash (as it did in and after WW2), and therefore the debt can never ever be paid off. Debt can be repudiated, defaulted or whatever you want to call it OR it can be inflated away. Guess which option is being chosen? (No cheating -- do not read the headlines in an newspapers.) The middle class is toast, and the middle class way of life is burnt toast. There is only one way out. The middle class needs start worrying about and focusing on physical survival and less about and on rescuing their investments. This means creating a path to survival for everyone, and that path is a return to a radically less resource intense way of life that is connected to the soil. It's happening spontaneously in some parts of Eastern Europe and it happened here in the 30s. But most of us now don't even know what kind of trees carrots grow in. :) That's where the gov't should be spending money. A major part of the reason this won't happen soon is that the middle class will focus its anger in the wrong direction, i.e. in recovering their investments. They will not readily identify with the people sleeping under the bridge. But until we are able to build a movement that will force the gov't to assist us in shrinking comfortably to a more sustainable way of life, we will simply affect the WAY in which we get screwed, but in no way affect WHETHER. A final note: there is no inherent reason the gov't needs to destroy the currency as it is doing. It could make the tax schedule steeply progressive, same for estate taxes and even institute asset taxes. But this would be labeled class war, even though there wasn't a peep when the table was being tilted in favor of steepening the pyramid. But no, the very wealthy believe they will be able to protect themselves against the ravages of inflation by gobbling up hard assets, such as land. And they'll be right until people begin understanding what ultimate resources for survival are, and the need for collective action in obtaining and utilizing them. After posting the above, it occurred to me that a much more sour note could have struck had I been in a more ornery mood. We middle class investors have been very much part of the problem. We have no complaints when our investments are going up -- we do not enquire too deeply about how are why they went up. (Very much like the Madoff investors.) But it would make an ugly story if one were to truly pull off blankets. Much of the world has been pillaged while the middle class investor's portfolio was going up. They were not disconnected events. But most of us now don't even know what kind of trees carrots grow in. :) That's where the gov't should be spending money. My wife and I have tried to start a community garden in part of a neighbor's lot. It works-- sort of. One day, in the late summer of the first year, another neighbor, a registered nurse (i.e., not supposedly ignorant or stupid) looked at some of the plants and said with some surprise "That looks a lot like broccoli!". Another neighbor, a retired Firestone Tire exec. said when he wandered over and carelessly pulled something out, "Is that an onion?" The owner of the land herself tried to be helpful by weeding -- and pulled out everything but the "weeds" from a planter box. We are a long way from the '30s in our ability to return to a simpler, less technological way of life. Why would anyone invest in the stock market right now? If you want to daytrade, maybe. But invest for long term? You'd have to be out of your mind. 1. Corporations are loaded to the gills with debt. 2. Management only cares about their own bonuses. 3. Dividends are miniscule to non-existant. 4. Share dilution (whether through options, or offerings) is an everyday occurence. 5. An SEC that is completely crooked and turns a blind eye to all sorts of illegal activities, even when tipped off. 6. Overly leveraged hedge funds. 7. An average market mentality expecting 10-15% (if not 100% growth) per year. I would say the stock market is basically a massive ponzi scheme, and you have the baby-boomers on the verge of cashing out. Without a massive continued influx of cash, the whole thing is poised to collapse. There are a few companies out there that I like, but I fear they may be dragged down by the rest of the rubbish. I am completely out of equities myself. My 401K is in T-bills and I am seriously considering cashing that out. It's only a matter of time before those funds are nationalized, and you will only be able to access them as an annuity when you are 62+. I don't see a silver lining. How much of the downturn is due to a change of belief that the market is crooked and if so, how many "heads on a pike" would have to happen to convince the 'consumer' that all is now OK-Do-kay and the crookedness is gone? how many "heads on a pike" would have to happen to convince the 'consumer' that all is now OK-Do-kay and the crookedness is gone? It's like we watched different editions of The Daily Show. Though Stewart attacked the dodgy financial guys, his focus was on the journalists. "You didn't seek the truth," he was saying, "which is your duty as journalists." It's a tremendous failure of the "fourth estate". For example, Shaun Carney asks, "How did we get here?" He expresses surprise at the sudden arrival of the economic downturn. Now, perhaps the editors of that major national newspaper were surprised, but many others did see it coming. They asked the hard questions and didn't like the answers. "the end of the third quarter of 2008 will be marked by a new tipping point in the unfolding of the global systemic crisis." The same people were saying similar things in 2006. David Andrews also saw trouble coming in early 2006, as did David Pollard. Even dumb old me in January 2008 predicted the US economy would tank in the second half of the year. I could go on, but while the various predictions of these people did not all come true, or not as they expected, with mistakes which are obvious in hindsight (for example, I forgot that if there's a recession then fuel demand drops, and thus the price of oil drops, too) that a financial crisis was coming was obvious to all people who did not have a financial interest in saying "la la la I can't hear you we'll get richer and richer FOREVER AND EVER." We were badly failed by a lazy and stupid media. And really that's what Stewart's piece was about. The investment bankers and the like at least had plain old "but then I'll get more cash" to excuse their lies and self-deception; the media is simply lazy and stupid. Despite what they say on TV, the media's purpose is not to inform the masses of truth. The media's job is to sell consumers' eyeballs to advertisers. That is what they get paid for. The big newspapers are all going bankrupt - not because they failed to inform the masses of truth - but because they failed to sell eyeballs to advertisers. I assume you are too lazy or cowardly to watch it. As a Jew, I'm familiar with hearing, laughing and shaking my head sadly about conspiracy theories of shadowy figures secretly controlling everything. Sounds like a reasoned response. BrianT: I assume you are too lazy or cowardly to watch it. ummmm, no. I watched the whole thing after a similarly uninformative post was made on the 17th. So that makes both of your assumptions invalid and mine self evident. Jeesh, the guy has been on the job for only 2 months now, How can you make a movie on his presidency already? Besides, most of these ponzi schemes flourished under Bush watch. I find the subliminal messages in the video quite laughable. The director was attempting to break through the dem/repub, my team/your team WWE mentality. Why do you interpret a criticism of Barack Obama as an endorsement of George Bush? I thought the director went to a lot of trouble to make it evident that he is not endorsing Republicans, NeoCons or George Bush in any way. It obviously fell on deaf ears. Maybe, but the Swift Boat Veterans for Truth were not supposed to be democrat or republicans either. IMO, the heavy subliminal techniques are more typical of a propaganda movie than a serious documentary. I don't think anyone seriously thinks of Jim Cramer as a journalist, more pundit, commentator, clown. He rightful criticizes the other CNBC "reporters" for cheerleading the market bubble and trading access for soft coverage of executives in troubled companies. But the interview that Stewart keeps going back to is where Cramer is explaining how Wall Street insiders can manipulate the market and make outsized profits. Of course the losers here are small investors (outsiders) who continuously pump money into the market. Stewart is asking a very simple question: Why should outsiders trust insiders with their money? Cramer doesn't really have an answer except that he knows he was wrong...may try harder to be honest in the future. Being sheltered up here in Calgary (Canada’s Most Republican City, far less globalised than Bradford or Leicester), I have only ONCE ever watched Cudlow and Cramer on the TV, and then by mistake. It was just after the US-led invasion of Iraq. This program was, I discovered, on some American business news channel called CNBC. I did wonder what a pair of really bad borsch-belt comedians were doing on a supposedly business news TV station. Mel Brooks would have fired both of them on the spot. And then of course, releasing the vultures”. (To which I would add tipping large baskets of poisonous snakes on them from low hovering helicopters and watching them die screaming in agony. Or just tactical nuculear weapons). “I know these views aren't popular. But I have never courted popularity." Don’t get me started on NASDAQ, which is the biggest scam game around. I would never again have a partner company that is listed on NASDAQ at any level, and I’ve had one as the operator … watching his 42 MM shares get churned 100% in a month, which he thought was terrific. If I were to start a new oil company, I wouldn’t want it listed on NASDAQ (or any other US exchange) or AIM. Those who ask us to invest do it not for any compassion for us but only for their benefit. A stock broker says buy this or that stock not because we may profit from it but because he gets a commission. The realtor says to invest in real estate. The insurance man says to buy an annuity. The banker says we should open a savings account. The gold bugs beg us to buy gold. Others beg us to buy futures in this or that commodity. A tax lawyer asks us to invest in his favorite tax shelter which of course drives up the value of his own investments. Even colleges and universities beg us to invest in our education at their school and will help us to graduate with debts earlier generations never had to deal with at such an early age. They only care about how much they can extract from the common folks. For over 30 years those at the top of the economic pyramid have been chipping away at the bottom and are surprised when the top falls off. They didn't believe the same rules applied to them and in many ways they didn't. If lowly clerk is suspected of dipping into the till then he is immediatedly fired. No chance whatever for defending himself or even seeing the evidence against him. If the CFO is suspected of wrong doing he is suspended at full pay while a months long internal investigation is carried out. If found guilty he is given his golden parachute and moves on to his Ivy League college roommate who gives him a new job at even higher pay. That brings us to the solution to our current predicament. The solution is to create more customers with more money in their pockets. Capital flows to where the customers are. Union busting has taken money out of customers pockets. Unfair trade policies have allowed the tax cuts given to the rich to create millions of very low wage jobs in China and India. Give American workers the same collective bargaining rights that European workers have. Establish trade policies which take the difference in labor costs into account via tariffs. Stop allowing the mythical invisible hand of the marketplace to absolve the rich from the moral and legal responsibility for the harm they do to individuals, communities and Mother Earth. And if nothing else is done stop using the existence or absence of economic growth as an excuse for not expanding economic justice. Well, there are 78 comments as I post this.. This thread is almost like TOD in the old days - what a joy! Well Todd, I am getting the opposite feeling. I am about to give up on discussions such as these because what I see occurring is a bunch of intelligent/educated blowhards puffing smoke up each others you know whats without facing what truly happens to a society, local or global, that undergoes collapse.. Talk about investors vs. the middle class, moving from equities to T bills, hoarding gold, income and investment, is everyone nuts?! Why do you think wealth in these forms is going to survive? If you really believe we are entering an new era due to economic (Wall St),environmental(GW), and/or over population catastrophes, I suggest you go back and reread Jared Diamond's book "Collapse". After TSHTF in Greenland, the Yucatan Penninsula (sp? )and on Easter Island there were no elite leaders, technologies, profits, investments or anything else left. It was GONE. Looks like the rich folks all ended up on the spit. I don't remember reading anything about a sudden bout of higher technology coming around to save the day, or did I miss something? I do think that the concept of small "tribes" has some legitimacy. We had better learn how to work with those around us. I am not trying to stop this discussion. I just wish it were more focused. But milling about smartly isn't making a lot of sense to me. A lot of you seem to be more interested in talking about where the Titanic should take its second cruise, even after it struck the iceberg and is going down. Personally, I'm more interested in locating the lifeboats. So tell us how you personally are preparing for the Titanic going down. Or are you milling about as well? Have you actually done anything? If so, exactly what and why? article and I forgot where the original link were but it fits this subject. How much substance is there in the article? Is it correct that government bailouts and federal bank lending is creating a disadvantage for small banks with lower credit risks and a higher portion of staff that keeps track of their customers and a very large advantage for giant banks with large credit risks and very little personal knowledge about their customers? Is your financial system realy contracting around your least efficient entities? I dont care much about who runs the show in USA but if someting like this is correct you ought to get a concentration of power and responsibility that no human or single company can handle. If such a trend runs to completion it would result in the extinction of one of the major feedback mechanisms that creates the complex free market that fine tunes the US economy and a large part of the global economy. Supreme power withouth the ability to rule wisely since it is beyond the capacity of a human or a group of humans to do what a diverse market full of manny humans do. This is realy scary stuff if you are headed anyway near this direction! I am more concerned myself with racism within Wall Street than class. Nearly every time we see or watch the media these days there is some arrogant bigotted white giving it biased lip against Obama's economic policies. I say that it is time ACORN was put into these racist Wall Street institutions so that they can be brought into line, through an ACORN re-education policy it should be possible to bring socialism to Wall Street and weed out the racist bigot troublemakers which give Wall Street a bad name.